While the causes of coronary heart disease and diabetes vary, scientific evidence from dietary studies has linked the consumption of animal products to these deadly ailments. Additional research has correlated consuming vegan foods (plant-based) with a lower risk of heart disease, diabetes, and a host of other chronic and debilitating disorders. For some people, improving their diet can be as simple as deciding to eat healthier foods, but for others it can be much more challenging—especially if they have limited or no access to healthy foods like fresh produce and whole grains in the areas where they live. More than one-third of US adults have some form of cardiovascular disease, which is the leading cause of death in the United States, and about nine percent of the population suffers from type 2 diabetes. Adults with diabetes are also at high risk for cardiovascular disease, with 68 percent of diabetes sufferers over the age of 65 dying from heart disease and 16 percent dying from stroke. Unhealthy dietary habits and a lack of physical activity play major roles in the development and progression of both heart disease and type 2 diabetes. The numbers of those suffering and dying from heart disease and type 2 diabetes are even more staggering among people of color. The Office of Minority Health, under the auspices of the U.S. Department of Health and Human Services, has shown that “Hispanic[sic] adults were 1.7 times more likely than non-Hispanic white adults to have been diagnosed with diabetes by a physician.”  Physician diagnoses of diabetes for Blacks have also been shown to be 80 percent more likely than white adults, and moreover, Native Hawaiians and Pacific Islanders are 2.4 times more likely to be diagnosed with diabetes. Native American, Black, and Latinx diabetics also die earlier than white diabetics (with Asians, as a whole, the only group that lives longer than whites). The diabetes death rate for Blacks is 39.5 per 100,000, an incidence more than double the diabetes rate for whites. One probable cause of this disparity is that communities of color are more likely to be located in areas that lack access to affordable, healthy, culturally appropriate foods. While many types of heart disease are influenced by diet, coronary artery disease is the variety most directly affected by people’s eating habits. 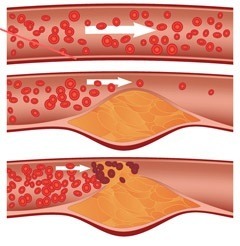 High blood cholesterol, excessive dietary cholesterol, saturated fats, high blood pressure, and smoking are all known to damage the arterial lining. When arteries are damaged, the body repairs injuries by patching over the lining, but with chronic damage, cellular debris accumulates and divides as more layers are added. This debris narrows arterial passages, reducing the flow of blood and oxygen to either the heart (resulting in heart attack) or the brain (leading to stroke). Whereas all animal-based food products contain cholesterol, all plant-based foods are naturally cholesterol-free. The average person in the U.S. eats more than 200 pounds of “meat” each year, which can indeed be a factor in the high incidence of heart disease. In addition to large amounts of dietary cholesterol, “meat” and other animal products also contain high levels of saturated fats that raise blood cholesterol. According to the American Heart Association, saturated fats and trans fats raise blood cholesterol. A high level of cholesterol in the blood is a major risk factor for coronary heart disease, heart attack, and stroke. Other factors such as high blood pressure, diabetes, and smoking can exacerbate one’s risk. Because cholesterol cannot be dissolved in the blood, the body must transport excess amounts to and from the cells by lipoproteins. A high HDL count (High Density Lipoprotein) is good because HDL cleans the blood of cholesterol and fats. High levels of LDL (Low Density Lipoprotein) can indicate trouble because it signifies an excess of cholesterol in the bloodstream, which could potentially clog arteries. Low levels of HDL (less than 40 mg/dL) also increase the risk of arterial blockage. The optimal LDL number varies according to your level of health. Your doctor can perform a routine blood test to determine your cholesterol level. Type 2 diabetes was originally known as “adult-onset diabetes” because it was almost unheard of among people under 40 years old only two decades ago;however, today type 2 diabetes is increasingly being diagnosed in adolescents. 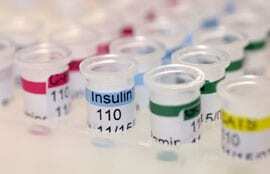 Medical experts estimate that type 2 diabetes accounts for 90 to 95 percent of all diagnosed cases of diabetes. The good news is that diabetics and pre-diabetics can effectively avert, manage, or even reverse diabetes through diet. This can be done by eliminating highly-refined, processed “white” foods, sugar-laden snacks, and trans fats while increasing fiber-rich plant-based foods like whole grains, vegetables, and nuts, which are low in saturated fats and naturally cholesterol-free. The official position of the Academy of Nutrition and Dietetics (AND), the world’s largest organization of food and nutrition professionals, is that healthy vegan and vegetarian diets can help prevent and treat a variety of chronic diseases, such as heart disease, cancer, and diabetes. According to AND, vegetarian diets tend to be lower in saturated fat and cholesterol and have higher levels of dietary fiber, magnesium and potassium, vitamins C and E, folate, carotenoids, flavonoids, and other phytochemicals. These nutritional differences may explain some of the health advantages of those following a varied, balanced vegetarian diet. The report also stated that plant-based diets are appropriate for people of all ages and activity levels, including pregnant and nursing mothers, infants, children, adolescents, and athletes. There is a substantial body of scientific evidence supporting AND’s endorsement of eating vegan and vegetarian as healthy and disease-fighting. For example, a lead surgeon at the Cleveland Clinic, Dr. Caldwell Esselstyn, started a study in 1985 that ultimately proved a low-fat, plant-based diet could significantly lower patients’ blood cholesterol levels—by an average of more than 100 mg/dL—and open clogged arteries. However you slice the facts and figures, it is clear that coronary heart disease and diabetes stem from the same risk factors: eating animal products and processed foods and lack of exercise. People can significantly reduce their risk factors for these and other diseases by making healthy lifestyle choices. You may think that changing what you eat will be difficult; however, what you eat can prevent or reduce your risk of dietary diseases and premature death, so choosing plant-based foods can truly be empowering, healing, and even life-saving for you and the animals.